A small example of the themed hotels and casinos along the Las Vegas Strip in Nevada, USA. Luxury hotels, billboards, casinos and shows are just a few of the fascinating things you will find along the Las Vegas Strip in Nevada, USA. Las Vegas is known as the city that never sleeps and is one of the most exciting places in the world to visit. 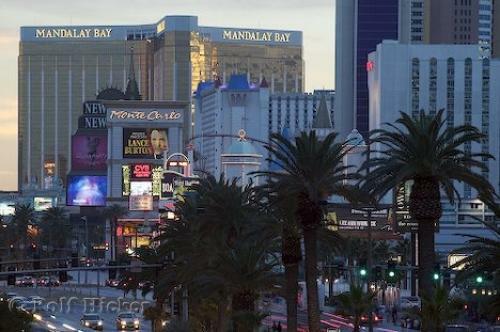 The strip is where all the action happens and is home to some of the world's largest hotels, casinos and resorts. Extravagant hotels run the four miles of the Las Vegas strip with each one having its own exotic theme and casino. In 1931, the first casino was built in Las Vegas and has continuously kept growing since then. Now it has become a world class place for tourists to go to stay at elegant hotels, gamble around the clock and take in some first-rate shows. Photo of the Las Vegas strip at sunset in Nevada, USA. I photographed this photo with the digital SLR camera model Canon EOS-1DS, aperture of f/18.0, exposure time of 4/1 sec. on ISO 50, as always I used a original Canon Lens, the focus lenght for this picture was 275mm.